We are proud to present the elegantly understated Classic Manufactum timepiece at BASELWORLD. This new watch embodies the ideal equilibrium of tradition and modernity. Everything about the design of the Classic Manufactum reflects the delightful classicism of the Belle Époque — the porcelain-type dial provides a perfect setting for the shiny black Roman numerals, the small seconds subdial at 6 o’clock features a ‘railtrack’ graduation typical of the pocket-watches of the era, and the slender gold-toned hands set the finishing touch to the perfectly harmonious overall effect. As for the contemporary element, this timepiece is equipped with the Chopard Calibre 01.04-C, a new mechanical self-winding movement. The exquisite movement – entirely created by Fleurier Ebauches, the Chopard Group unit producing industrial movements not destined for the L.U.C Haute Horlogerie collection – drives the hour and minute hands, along with small seconds and a date display at 3 o’clock. Beating at a frequency of 28,800 vibrations per hour, it guarantees a generous 60-hour power reserve. Following certain models of the Chopard 2011 IMPERIALE collection being equipped with this movement, this is the first timepiece in the Classic collection to receive an ‘in-house’ movement. 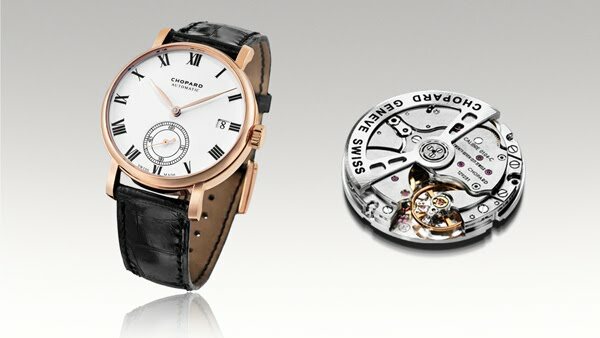 As such, the Classic Manufactum heralds in a new collection at Chopard. With its refined exterior available in 18-carat rose, white or yellow gold, the beautifully rounded 38mm-diameter case features an 18-carat gold crown and an exhibition back, and is fitted with a matt black alligator leather strap with an 18-carat gold pin buckle. Like a noble fragment of history that has found its way unscathed through time, the Classic Manufactum is a link between the prestigious pocket-watches that forged the reputation of brand founder Louis-Ulysse Chopard and modern-day wristwatches.